THON – the Penn State IFC/Panhellenic Dance Marathon – Last year the event raised more than $12 million to benefit the families of children with cancer. 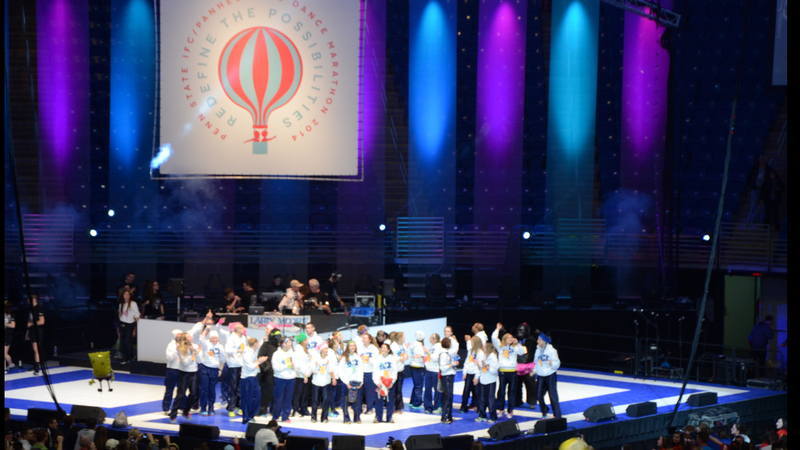 Each February the dance marathon fills the Bryce Jordan Center at University Park with 15,000 people for 46 hours. These are some of their stories from Saturday. Friday stories here. Sonya Whitman has battled cancer twice and been victorious on both occasions. She was diagnosed with osteosarcoma, a rare bone cancer, early in her adolescent life and is now finally cancer free at the age of 20. This was her first experience at THON and she now pursues a career in nursing to help others battle through their illnesses just as her nurses helped her. Penn State EMS makes sure that everyone who needs care at THON gets care. Penn State EMS and Thon work together to make sure everyone is cared for. Ashley Hernandez is a member of the Rules and Regulations committee AmERICAn GladiatoR&Rs. She reports from teh Bryce Jordan Center that a process employing scannable bracelets is allowing people to avoid standing in long lines as they wait to enter THON. 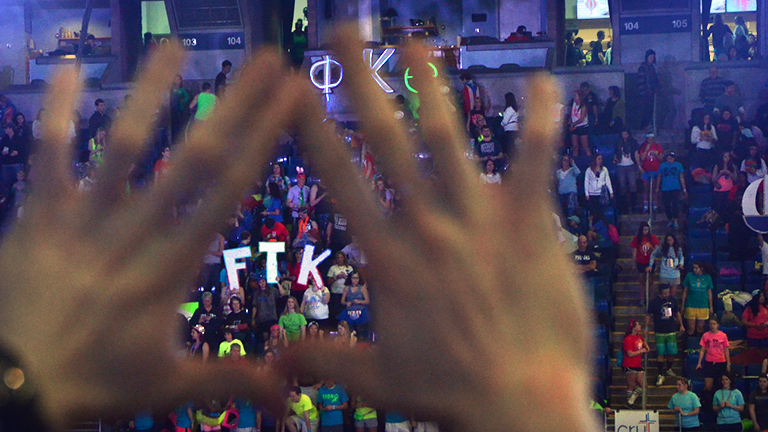 Every person at THON has a purpose. Some dance, others morale and many come to celebrate. But for members of The Daily Collegian on press row, the weekend is far from a break. Collegian Campus Editor Alison Shapiro helps lead the charge with long hours and a positive attitude. Mia Rendar is a junior Penn State student who is participating in THON for the third year in a row. She has previously served on the club committees and supported the dancers in her committee. This is her first year as a THON captain in finance. Jake Robatel is a senior of Penn State taking classes online through World Campus. He is a member of the Kappa Delta Rho fraternity at Penn State. During his junior year, he had to withdraw from the university for personal reasons. He moved to New York City with his brother and began working full time. Although he does not live at main campus anymore, he said that THON is still a big part of his life and has made plans the past two years to attend the event. He still encourages friends and family to donate to THON and makes whatever donations when he can. Holden Farhani is more than a Subway employee. He is a father of three and Penn State alum who is currently a member of the Four Diamonds board. Farhani has been helping with Thon since his days as a student when Thon was in the White Building. 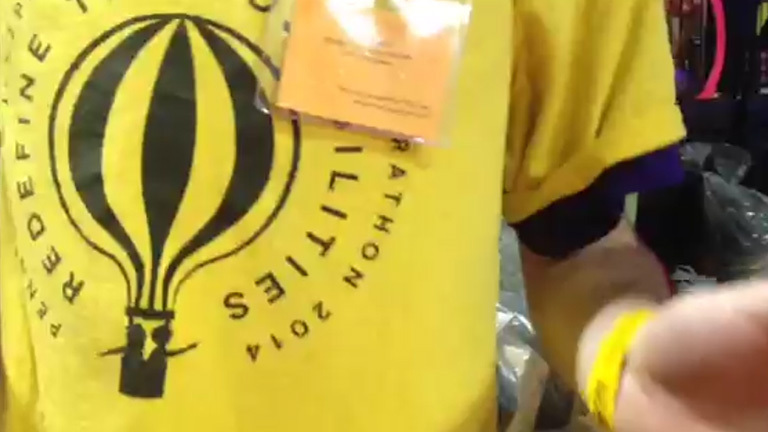 This afternoon, I worked a shift for the Instagram booth at THON, which granted me floor access. Part of my job was to recruit people to leave the floor for a quick minute to make a quick photo. We asked the people to write a message on a whiteboard to answer the question Who Do You Dance For (#wdydf) at Thon? In the picture above you can see me on the left, THON child Nick Fulton, an eleven-year-old from Elliottsburg, Pa., center, and his parents on the right. In two days our team posted more than 500 pictures on Instagram using the hashtag #wdydf. You can see highlights from the photo shoot at commedia.psu.edu/news/story/thon-instagram-feed-who-do-you-dance-for-wdydf. 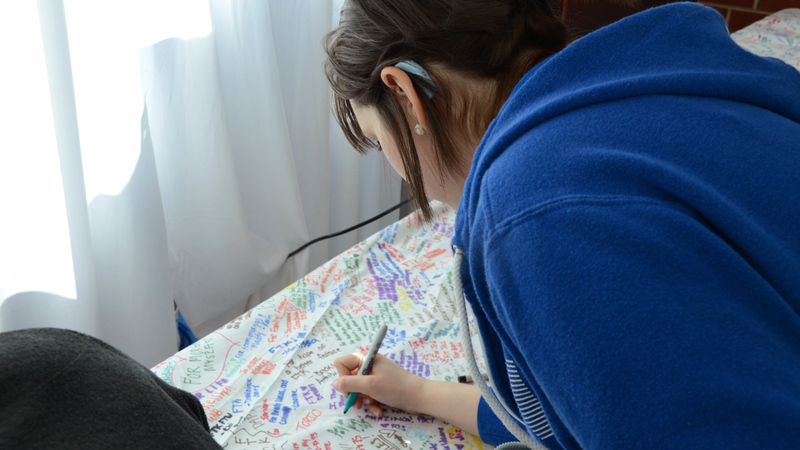 All of the #wdydf photos are on a special website at blogs.comm.psu.edu/thon/. The feeling of being on the floor and not the stands was overwhelming. While working I got to meet more dancers outside of my organization and THON families. This gave me a better grasp of why this is the largest student-run philanthropy in the world. Penn State stands for a many things. THON is one of the biggest. Bret Turner, for THON 2014, is the Weekend Warrior for the Merchandise Committee. Being a junior he has volunteered his time in previous THONs but this year’s is exceptionally special to him. THON is probably the one event at Penn State where the crazier the outfit the better. Freshman Kyle Hardy says he is enjoying his first experience at THON. He went all out for his outfit. Representing the Ohana organization he wearing a bright orange shirt, fairy wings and glowing shoe laces. What does THON mean to a student that doesn’t attend? Why choose not to participate in what many Penn State students describe as the best time of their Penn State tenure. Leah Eder, a junior majoring in fine arts, manages an eight person staff during THON weekend as the Daily Collegian’s photo editor. Eder is also taking pictures, and shooting from press row managed to make a memorable shot of the Nittany Lion dancing with a Four Diamonds child. Rainier Lopez is a senior broadcast journalism major working on an assignment for his multimedia reporting class. He is doing a feature on his friend Harrison Wieder, who is dancing for Pillar, a THON special interest organization. The dancers get a boost early Saturday morning when packages and letters of support are delivered to them at the Bryce Jordan Center. Broadcast journalism senior Sam Minnec is part of the student team that is covering THON. They are producing a live broadcast of the event that is being broadcast on campus cable and streamed around the world. There are nine sisters from Delta Gamma sorority dancing in THON this year, five of them as independents. Included in the latter group are best friends Jaime Pritzker and Olivia Peralta. Pritzker is wearing dancer number 323A. She is filing these video reports from the floor of the Bryce Jordan Center. Bernard is an aspiring broadcast journalist, aiming for a career in the sports industry. Centre County Report is his first newscast. Outside of CCR, Bernard currently is Vice President for PSJAD and is a peer mentor for the Diversity Ambassadors on campus. 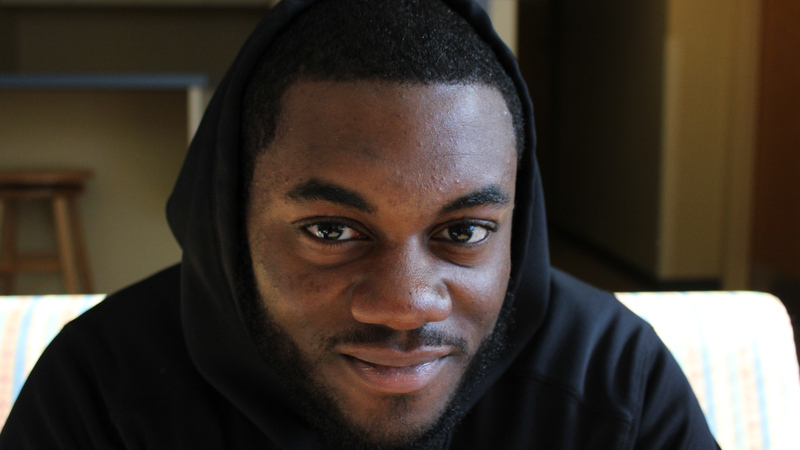 Besides broadcast journalism, Bernard is currently a sprinter on the Penn State track and field team. Currently a Senior Broadcast Journalism Major from Flushing, Queens looking to pursue a career in the field of sports and hope to one day be a writer, reporter, analyst ,commentator or anything that has to to do with the game of baseball or basketball. Nasser Monayair, ‘14, is a senior from New York, NY. He is a broadcast journalism major at the college of communications at Penn State University. He’s a co-host for a Com Radio show “Empire State Boys”. Nasser, has worked and written articles since he was in high school. Nasser is also a member of John Curley Center for Sports Journalism. He has experience in radio prior to joining Com Radio. Nasser hopes to continue his career in radio and hopes to host his own sports show which will cover all sports topics including a few of his favorite teams such as the New York Knicks, New York Giants and New York Rangers. Nasser also enjoys listening to broadcasters such as Marv Albert, Michael Kay and Scott Van Pelt. Although I am a Journalism Broadcast major, I have a Kinesiology minor and would like to pursue a career health and/or sports related. I have completed supplemental Kinesiology classes and have surpassed the requirements of the minor. I am going to take my certification test over winter break and plan on becoming a personal trainer. Jeremy Meyer is a senior majoring in Broadcast Journalism with a minor in English. He has a passion for all things sports and has held internships with Penn State Baseball and the State College Spikes where he worked as an assistant producer of in-game entertainment. Jeremy plans on graduating this May and working another summer with the Spikes organization to continue to build upon his skills. His goals are to work his way up in the world of sports production and to one day direct/produce a major sporting event such as the Super Bowl. 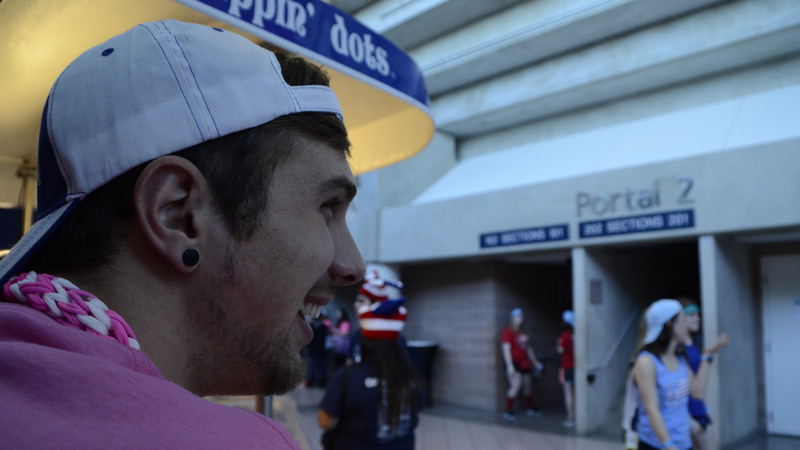 Derek is pursuing a career in Broadcast Journalism accompanied with a Theatre minor. He is actively involved with PSN News as a reporter in which he takes on assignments weekly on current events on campus. Responsibilities include gathering information, interviewing the public, filming, reporting on camera and finally editing the clips into a package that will be aired on PSN News. He held an active role in Penn State’s IFC/Panhellenic Dance Marathon, commonly known as THON. His position as a committee member of the Merchandise Distribution committee provided him with many responsibilities. Throughout his senior year, he collaborated with his fellow committee members to sort and send out items while contributing to merchandise sales on campus to raise awareness and money for THON’s mission: to conquer pediatric cancer by providing outstanding emotional and financial support for the children, families, researchers, and staff of The Four Diamonds Fund. During THON weekend his title was Weekend Warrior where he took on responsibilities of overseeing the members’ shifts and acted as a communication liaison between captains and committee members. He has a passion for the performing arts and has played various roles throughout his college career including The Children’s Hour, N.O.W., a student written, acted, directed and produced performance, and he has even sought out roles for independent short films such as Outlaw Studios production entitled “Disposable”. Brittany Horn is a senior majoring in print journalism from Strasburg, Pa. and the editor in chief of The Daily Collegian, Penn State’s independent student-run newspaper. A member of the Schreyer Honors College, Brittany plans to graduate in May 2014 and pursue a career as a Hearst Fellow with the Hearst Newspaper group as a full-time reporter. In addition to her time at the Collegian, Brittany has held internships at The Pittsburgh Post-Gazette, The Harrisburg Patriot-News and the Lancaster Sunday News. She placed third in the Hearst National Journalism Championships in San Francisco this past summer. Kristin Stoller is a senior from Newtown, Conn. majoring in print journalism with minors in French and theater. She is currently the managing editor of The Daily Collegian, Penn State’s independent student newspaper. She has interned as a reporter with USA Today, the Hartford Courant and the New Haven Register. Most recently, Kristin placed seventh out of 148 students in the Hearst Journalism Awards Feature Writing category for her story on the people of Newtown, Conn. after the tragic shooting. Born in Acapulco, Mexico, Ashley Hernandez has always been interested in the field of Communication. She was a host of a TV show called RTG Kids, which is how she became passionate about Broadcast Journalism. Ashley’s other strong interest is culture, that is why she decided to study abroad in Barcelona, Spain her junior year of college. On her free time, Ashley enjoys dancing and planning future trips that she hopes might happen soon. Her goal after graduation is to go back to Europe and work in International Communications where she can use her Spanish and English speaking skills in her everyday life. Jaime Pritzker is from Bryn Mawr Pa. She is majoring in broadcast journalism, with minors in both business and international studies. At Penn State, Jaime is a production assistant and audio producer for B94.5 Morning Zoo radio station. She is also a member of Delta Gamma Fraternity. 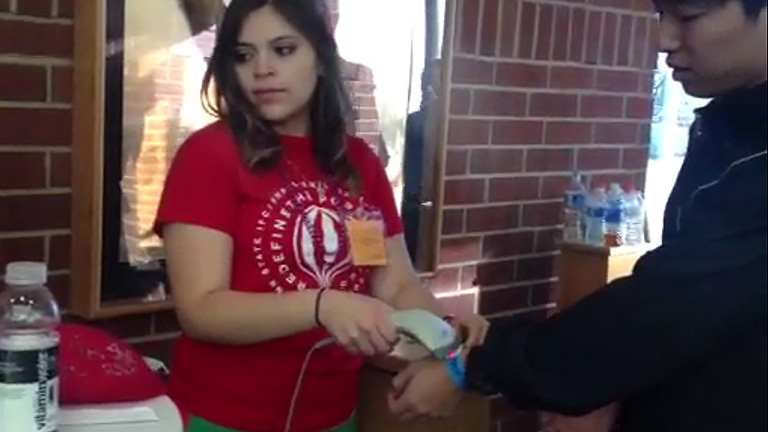 Upon graduation in May, Jaime wants to pursue a career in television production. Chelsea Clemens is a Senior majoring in Broadcast Journalism from York, Pennsylvania. Chelsea is minoring in Communication Arts and Sciences and is also a member of the John Curley Center for Sports Journalism. She is expected to graduate in May of 2014. Before transferring to Pennsylvania State University, Chelsea was a member of the Women’s Volleyball Team at West Chester University, as well as a member of WCUTV and the College of Communications Association. At Pennsylvania State University, she has been an active member of PSNTV and ComRadio through her roles as anchor, reporter, analyst, host, photographer, editor, writer, producer, and production coordinator. She has also been involved in other organizations within the University including: AWSM, THON, and the College of Communications Student Council. She has gained experience through an internship with WGAL Channel 8 in the sports department, which enabled her to learn the ropes of not only sports broadcasting, but news as well. She has also been involved in numerous job shadowing experiences, one in particular with JPL located in Harrisburg, Pennsylvania where she gained experience in the realm of advertising, business to business marketing, and digital. I am a senior at the Pennsylvania State University majoring in Broadcast Journalism with a minor in English.